Bobby interviews Elissa Bjeletich, the host of the AFR podcast "Raising Saints" and the author of the new Ancient Faith Publishing book In God’s Hands: A Mother’s Journey through Her Infant’s Critical Illness. Mr. Bobby Maddex: Welcome to Ex Libris, the podcast of Ancient Faith Publishing (formerly Conciliar Press). Today I will be speaking with Elissa D. Bjeletich. She is the author of the new AFP book, In God’s Hands: A Mother’s Journey through Her Infant’s Critical Illness. Welcome to the program, Elissa. Bobby once again interviews Fr. Vassilios Papavassiliou, author of the new AFP book Thirty Steps to Heaven: The Ladder of Divine Ascent for All Walks of Life. 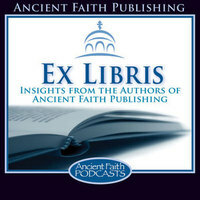 Mr. Bobby Maddex: Welcome to Ex Libris, the podcast of Ancient Faith Publishing, formerly Conciliar Press. I’m your host, Bobby Maddex, and today I’ll be speaking once again with Fr. Vassilios Papavassiliou. He is the author of another new Ancient Faith Publishing book: Thirty Steps to Heaven: The Ladder of Divine Ascent for All Walks of Life. Welcome back to the program, Fr. Vassilios. Bobby interviews Annalisa Boyd, the author of the new Conciliar Press book Special Agents of Christ: A Prayer Book for Young Orthodox Saints. Bobby Maddex: Welcome back to Ex Libris, the podcast of Conciliar Press. I’m your host, Bobby Maddex, and today I’ll be speaking with Annalisa Boyd, the author of the brand-new Conciliar Press book, Special Agents of Christ: A Prayer Book for Young Orthodox Saints. Welcome to the program, Annalisa.